Steem Monster Daily Quest Results and New Reward Cards. New Steem monsters Cards were released yesterday, Unfortunately, today I was not able to pull out any one of them despite getting five rewards cards on my daily quest. 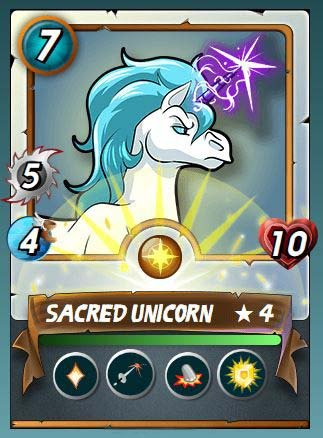 I'm looking forward to owning the new Legendary Life Splinter card - Sacred Unicorn, I think its super cool and its abilities will reinforce my teams as I get ready to join the Tournaments. 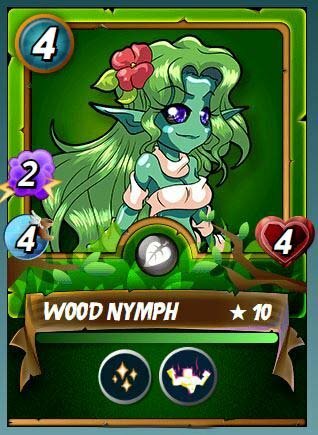 Another cool Monster card released on the market is the Common Earth Splinter card - Wood Nymph! I have a complete leveled earth team, but I don't have a cool summoner to go with the team, when I have to use the earth splinter I use Selinia Sky who is the most useful Sumonner I have because the rest are still stuck on level 1. Both of these new cards (Sacred Unicorn and Wood Nymph) have the heal ability with the Sacred Unicorn healing itself and the Wood Nymph healing its team-mates. Personally, I think between this two the Sacred Unicorn is the most powerful, but it all depends on the level of your cards and Monsters arrangements. On my Daily Quest, I'm still stuck on the silver 1 league and the battlefield is getting tougher, I plan on using the mass players gathering during the end of the season to at least reach the Gold level, I believe its achievable. Today on my daily quest, I got two Rusty Androids (I'm getting lots of this on a Daily, I plan on using them to level the Droid to the maximum if possible and give some to friends who are new to Steem monsters or those looking forward to level their Android), the other card reward is the HIghland Archer who I use the most when I have Life Splinters as an Enemy, I also got a Sea Genie ( I had an enemy with a Sea Genie Maxed to Level 4 and this Card was powerful, It took out my Team within a few Rounds, and finally I got a Rare Flame Imp. If you would like to get yourself some steem monsters, buy some steem monsters here using steem, SBD or VISA Card or check out my latest giveaway post. I give out steem monsters cards every seasons on my giveaway posts so make sure you follow me @jamesndungu which is the same handle you can challange me with on steem monsters. You just got a 1.68% upvote from SteemPlus!